In his open letter to the Manila Bulletin, British national and self-proclaimed Filipino-at-heart Malcolm Conlan, demanded an apology from the newspaper agency, after its report about the Philippines being the second most hated country in Taiwan. Conlan said that he uis disappointed in MB for the report which he called "nonsense, ridiculous, immaterial and unproven". The said report was headlined "PH 2nd most hated country in Taiwan", was shared over 3,000 times on Social media and was published on June 29, and said that the source of the information was the Taiwan Public Opinion Foundation survey. Besides the name of the source, the only fact about the survey that was presented is that 52.9 percent of the respondents said that they hated the country, and a quote from Manila Economic and Cultural Office (MECO) Chairman Angelito Banayo lamenting the result. Conlan said that he has concerns over the article, such as the details of the said survey, and the number of respondents who participated. He also noted that the article made no mention as to why Taiwan allegedly hated the country. "You then feature of a photo of a Philippine flag being burned. When was this? Was this just a random flag burning event or was it a protest of some kind? What was the context?," he added. 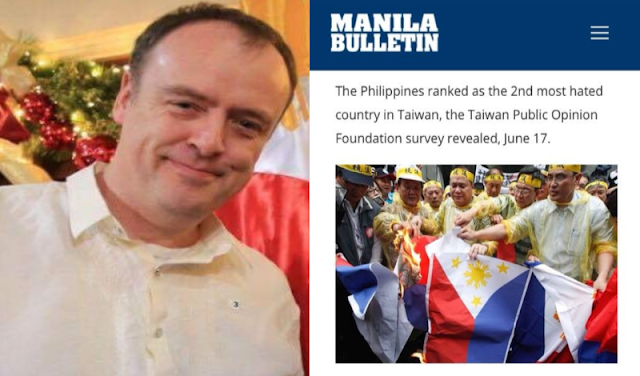 "I have now been informed that this photo of the Philippine flag being burned is an old archive photo from a few years back. So in fact you are not reporting news at all. Merely dragging up old news to make the country and President look bad," he added. He said that the news could be a dig to the Filipino President. "Is this a dig at the Philippine President or indeed Filipino citizens? How do you expect the Filipino public to react? Or is this just another case of fake news, just to gain likes, at the same time, embarrass the Philippines internationally?" he said. He added that since his children and family are Filipino, he finds the story unsettling, unnecessary and inappropriate. "It saddens me that the country I love and respect deeply is hated by anyone, if this is the case, I would like to understand why? Furthermore, I would hope that the Manila Bulletin apologises for carrying this nonsense, ridiculous, immaterial and unproven report," he said. I am writing to you to express my great disappointment in your story today, which has since been shared on Facebook many times. 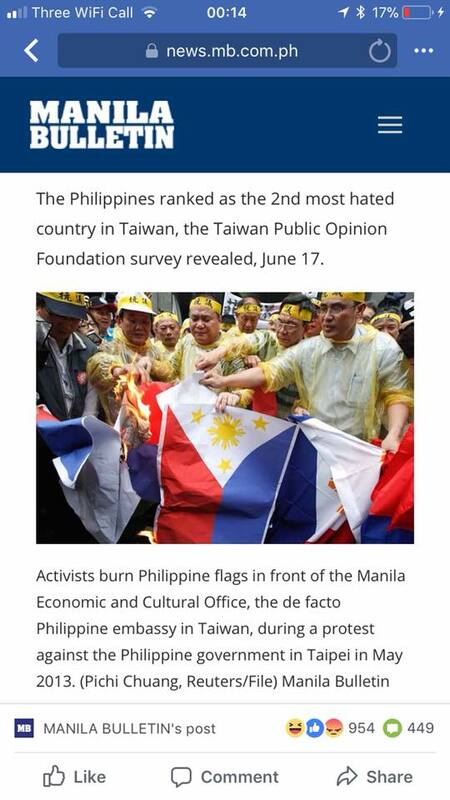 In it, you claim that the Philippines is the 2nd most hated country in Taiwan? I have several concerns over this, firstly, in the article, you make no reference as to how this news was collected? Was it as a result of a survey? If so how many respondents took part in the survey and how many Indicated that they hated the Philippines? Also your article makes no mention of why the Philippines, according to your report is the 2nd most hated country? You then feature of a photo of a Philippine flag being burned. When was this? Was this just a random flag burning event or was it a protest of some kind? What was the context? (Update: I have now been informed that this photo of the Philippine flag being burned is an old archive photo from a few years back. So in fact you are not reporting news at all. Merely dragging up old news to make the country and President look bad). I believe that your article may firstly lead to a possible diplomatic crisis with Taiwan as none of the facts you claim have been proven? Secondly, why feature this story at all? Is your newspaper trying to claim that the Philippines is not respected overseas? Is this a dig at the Philippine President or indeed Filipino citizens? How do you expect the Filipino public to react? Or is this just another case of fake news, just to gain likes, at the same time, embarrass the Philippines internationally? I for one, am very angry and upset to see the Philippine flag being burned in public. Particularly as my family and indeed children are Filipino. I find this story deeply upsetting and unnecessary. I believe it is entirely inappropriate. I would like to know what your publication intends to do with this information and survey results? It saddens me that the country I love and respect deeply is hated by anyone, if this is the case, I would like to understand why? Furthermore, I would hope that the Manila Bulletin apologises for carrying this nonsense, ridiculous, immaterial and unproven report.